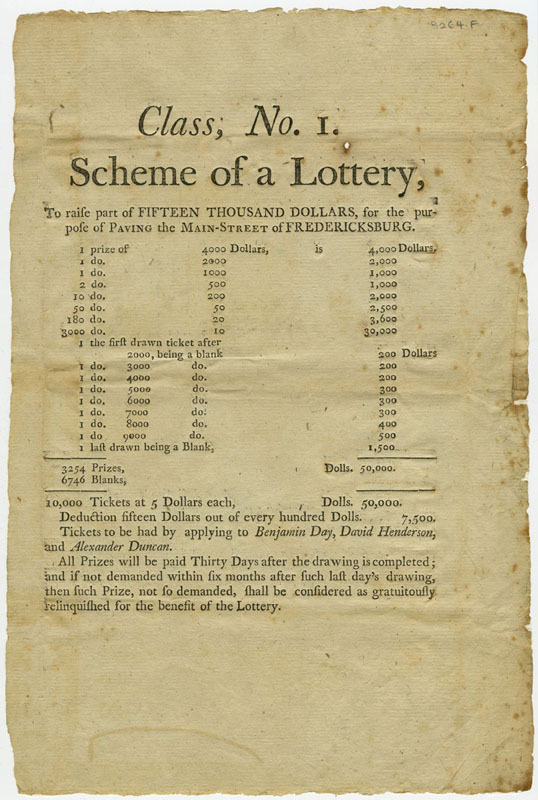 Since the Colonial era Americans used lotteries, rather than tax hikes, to raise money to fund important endeavors such as making internal improvements, building educational institutions, and waging wars. 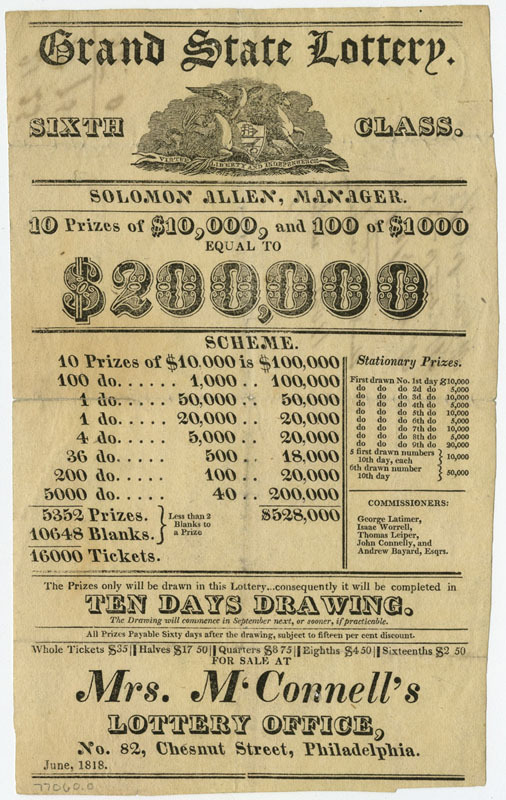 In the 19th century public lotteries continued in the same vein, and were joined by private lotteries organized by individuals and companies. By the 1810s the number of lotteries began to rise exponentially, making way for an entirely new profession, the lottery broker. Once sponsoring parties had been granted a franchise, the middleman-broker would oversee every aspect, including ticket sales, advertising, and payouts. Many lottery brokers would go on to stellar careers in banking, such as ticket salesman John Thompson, who founded the Chase National Bank (Chase Manhattan) in 1873. 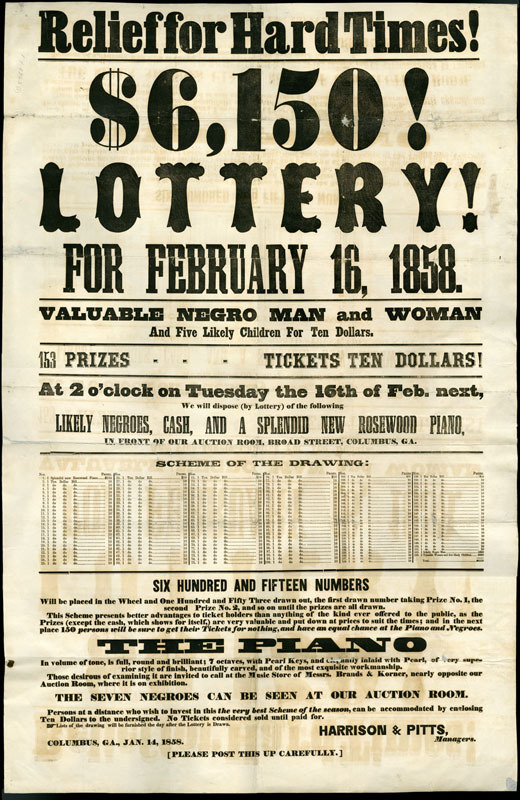 Although states began outlawing lotteries in the 1830s, they remained popular throughout the century; believing as much in luck as in the self-made man, Americans continued to buy lottery tickets in the hopes they could obtain something for nothing. 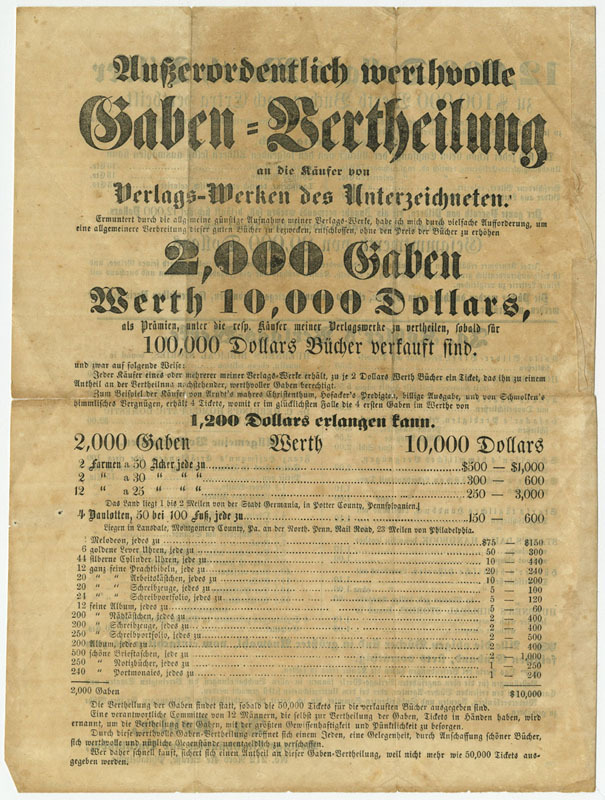 These broadsides, representing lotteries from throughout the 19th century, demonstrate the ways in which lottery operators employed eye-catching typefaces, bright colors, and enticing headlines to convince people to buy a ticket. Despite the fact that players knew they faced long odds and the schemes could be bogus, they nevertheless continued to play, often investing significant amounts of money – a week’s worth of wages or much more (if players purchased an entire package of tickets). In addition to the impressive list of figures and odds (appealing to the rationality) and promises of cash and prizes, the posters are punctuated by dollar signs and exclamation points (appealing to emotion). Class No. 1 Scheme of a Lottery. [Fredericksburg, Va., 1804]. Ignatius Kohler. Ausserordentlicht werthvolle Gaben-Vertheilung. . . Philadelphia: Ig. Kohler, [1858 or 1859]. Uriah Miles. 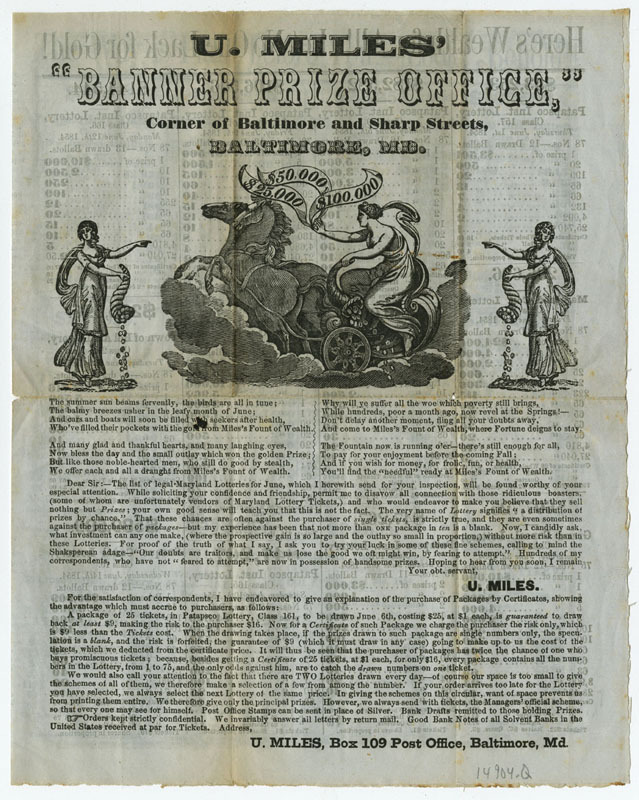 U. Miles’ “Banner Prize Office.” [Baltimore, 1854]. Grand State Lottery (PA) Sixth Class. [Philadelphia, 1818]. R. France & Co. Maryland Lottery to be Drawn on the Havana Plan. [Baltimore, 1856]. Hammett & Co. Brilliant Lottery on the Royal Havana Plan of Single Numbers. [New York?, 1864].